If you still feel like the 90’s were ten years ago, chances are you grew up during them like I did. I miss those days so I am taking a stroll down Memory Lane and revisiting 7 dorm room things only girls who studied in the 90’s will remember. Who did not have at least fifty Calvin Klein ads taped to the concrete block walls? We definitely did! And we also remember how scandalous they used to be but compared to today’s Victoria Secrets and Abercrombie ads, they are practically PG-rated. We still love those black and white somber-looking underwear models. Cell phones were barely in existence in the 90’s and even then it was only for the elite. So instead, every dorm room shared a land line for students to call home (or more likely, call their boyfriend across the country). But these were not just any phones! No, no! We had cool see-through phones or phones shaped like red-hot lips or a hamburger. When was the last time your cell phone doubled as table art? You may have a sleek stereo that plays music from MP3s, but we had space-eating boom boxes that could hold six CDs at one time and even had a tape deck! Sure, you had to have a table to store that bad boy on, but it was worth it to be able to listen to New Kids on the Block or Madonna! You read that right. Computers were massive machines and most people didn’t bring their own to college. Instead, we had to go to the computer lab and bring our floppy disks! These days, students toss their slim laptops and jump drives in their purse and set up a study area anywhere they want to. So lucky! Girls of the 90’s did not go anywhere without their jam-packed Caboodle! Where else would we keep our scrunchies and lip smackers? These awesome organizers had trays that pulled out, a mirror, and even a lock. Seriously, we do not know how girls make it through life without a Caboodle these days! You were not cool unless your dorm room had one of these fire hazards in it. Choose your favorite color and veg out while waiting for the lamp to warm up and produce hypnotizing orbs of burning hot lava. We’d even throw caution to the wind and keep our lamp burning all day and night like any irresponsible college student would. Do they still make these? If so, we’re getting one for our room today. As awesome as the 90’s were, we did not have many of things that college students take for granted these days: Keurigs (life could have been so different with instant coffee!) satellite TV, or memory-foam mattresses. We would have wasted much more time in our dorm rooms if we had such luxuries. Those were the days, my friends! 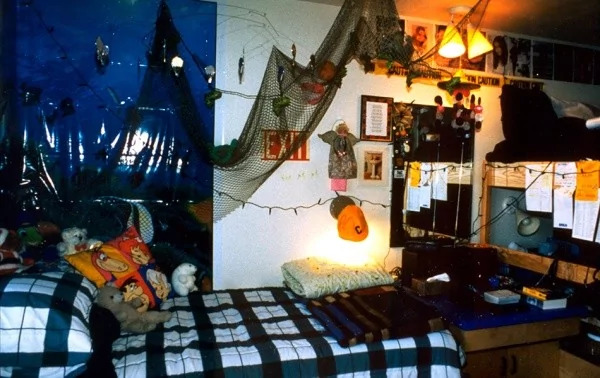 Dorm rooms were way cool and funky in the 90’s and we have to admit, we kind of miss the angst that consumed the younger generation back then. Where are all the Claire Danes and Jared Leto’s these days? Take us back to bad fashion and big shoulders, huge phones, and frizzy hair! Let’s hear it for all the 90’s girls!